So us here at ACE have a show at the Beale center for Art and Technology, opening on June 3rd (Thursday). As such, I’ve spent most of yesterday and today setting up the physical incarnation of the Infinicity project. I’ve got the pad controlling motion through the suburb demo. Stepping forward moves the viewpoint forward, stepping back produces backwards motion, and stepping to either side causes the camera to turn in that direction. I’ve also added a splash screen- it alternates through three shots from the various pieces of the app (to be updated as the visuals improve) until a coin is inserted. 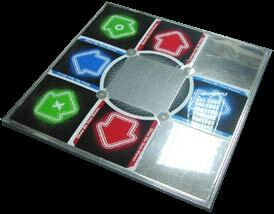 Once a coin is inserted, the user is free to move around the space via the DDR pad. The time a quarter buys isn’t strictly limited, but if there is no motion on the part of the user for a set period, the app reverts to the splash screen until another quarter is inserted. 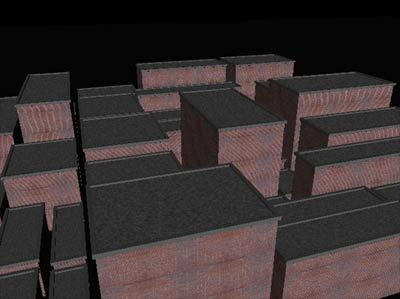 I’ve got buildings-aplenty, being rendered via a recursive algorithm. Other than that, there’s been progress made on the interface front. I’ve got it responding to a coin interface I built awhile ago (pictures to come soon), and I have the navigation being controlled via a gamepad. 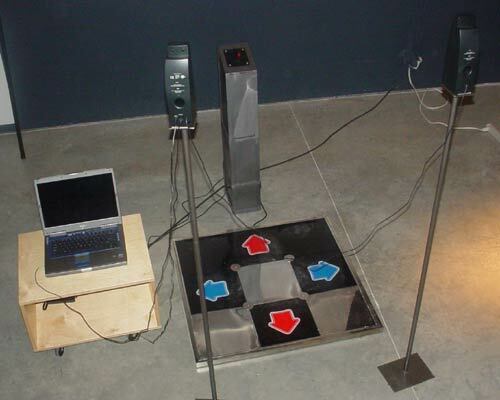 In it’s final form, navigation will be driven by stepping on a metal Dance-Dance Revolution pad. I just received the pad on Saturday, but need to modify the code a bit, as the pad registers as X/Y axises rather than button presses. 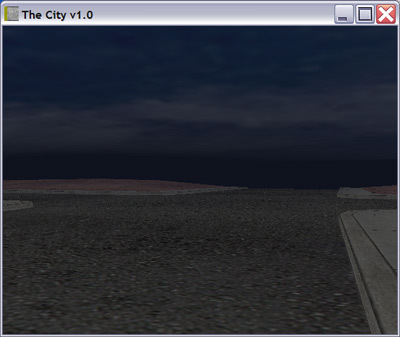 I’ve started in on the creation of a coast for the infinite city, with the above results. The textures are just stand-ins, and will be improved. 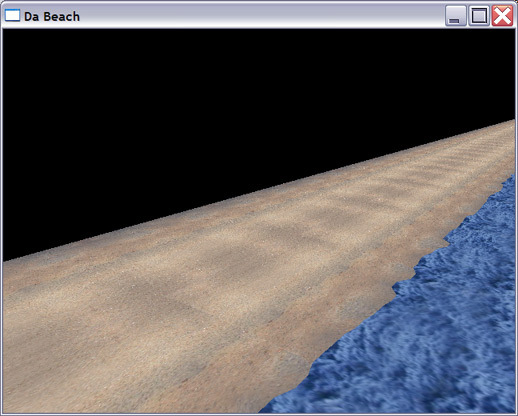 Also, the water doesn’t yet animate, and the coast could use some more variation than it presently has. So I’ve been thinking that the next thing I want to add to the infinite city is a coastline, and that I want the coastline to have piers extending out into the ocean. While thinking about how best to approach that, I started thinking about generating an infinite variety of worn planks with which to construct the piers. I’ve coded up an algorithm that does just that, with results to the left. Haven’t had time to add texture support just yet, but the final version will also select from a few different textures based on random choice and the aspect ratio of the plank. If you’d like to see for yourself, click here to download the demo app. The arrow keys will rotate around the plank, and F3 will cause it to alter itself. Note that there’s currently no bottom to the plank. I’m undecided as to whether or not to add one, as it adds polygons that aren’t likely to be seen, and a savings of 8 triangles per plank times lots of planks could end up being worthwhile.